One of the two electric vehicle charging stations at the Bay Street parking lot, in this photo, is being used to recharge an EV while the other charging is blocked by a gas-powered car. 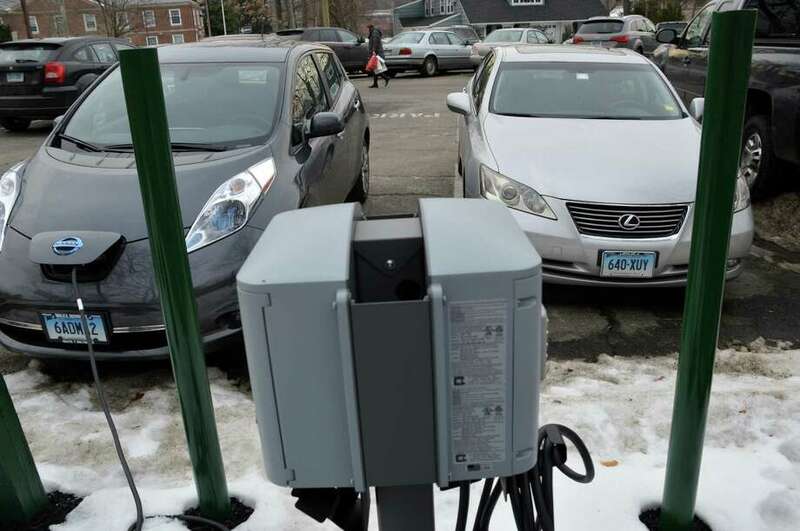 Continuing its campaign to reduce Westport's carbon footprint, the town's Green Task Force wants an electric vehicle-charging station installed at Staples High School. Thanks to the town's record in the recent statewide Neighbor-to-Neighbor energy-conservaton challenge, approximately $44,000 worth of energy-efficient equipment was awarded to Westport. Among the items is a vehicle-charging station that the task force hopes can inspire student drivers and the town at large by being installed at the high school. "I think it would be a nice gesture and also a good example to the community," member Pippa Bell Ader said at Tuesday's meeting. While the task force hasn't broached the idea with the Board of Education, members hope the panel will support the idea. The task force will provide the charger, which could be a Level 1 or 2, depending on various factors, and would pay for its installation. While Level 2 chargers are able to power up a vehicle more quickly, there would be considerably more flexibility in installing a Level 1 charger, which could hypothetically be networked to an outdoor light, rather than having to be connected to a power source inside the building. There currently are eight electric vehicle chargers situated throughout town, including four on the northbound side of the Saugatuck Railroad Station; one in the parking lot on the southbound side, two at Lydian Asset Management, 495 Post Road East, behind the fire station, and the most recently added are two between the municipal parking lot and the parking lot of the Tri-Town Teacher Federal Credit Union of Westport at 61 Jesup Road. During the meeting, however, task force members expressed disappointment that the train station spaces aren't restricted to electric vehicles, thus sometimes preventing drivers of electric vehicles from being able to use them because gas-powered vehicles are parked there. "I think we need to make it clear that these are special spots for electric vehicles," Ader said. The way the spots are currently posted, however, if they're not occupied by an electric vehicle before a certain time, gas-powered vehicles are allowed to take the space. "The idea is to encourage more electric vehicles," said Stephen Smith, an official from the Building Department who serves on the task force. If possible, the task force would like to see the parking spaces, which are fueled by solar panels atop the depot building, exclusively reserved for electric vehicles. Another idea still being considered is to specifically assign the sought-after spaces to those who invest in new electric vehicles. Others, however, contend that by so narrowly restricting use of the parking spots it is unfair to people who continue waiting for a railroad parking pass. "There's a list of 3,000 people on the wait list," Smith said. "The idea would be to encourage someone that's on the wait list who's got a gas car to switch and buy an electric car to get that space." Task force members agreed that they need to step up efforts to spread the word about the charging stations, and to encourage local electric car owners to become more vocal about their needs. "The more people hear that there's a demand for those spaces, the more likely their going to change their policy," Smith said. "We haven't done a good job yet ... publicizing it to the public at large," said Chairman David Mann, noting that the information has mainly been shared with electric vehicle owners. "The idea of using a town resource to push out the idea may not be a bad idea," said state Rep. Jonathan Steinberg, who attended the task force meeting. "Rules change when we have demand," he said, "so we have to demand."